Rien Ne Va Plus is released this August to celebrate the anniversaries of two big events in the Chad & Jeremy story. This summer marks the 10th anniversary of Chad & Jeremy's 21st century reunion, and the 50th anniversary of their first studio recording session in 1963. "Rien Ne Va Plus", loosely translated, is a French saying for "the die is cast". It is often used to indicate that no more bets can be accepted on the spinning roulette wheel. All bets are in on the first decade of C&J's reunion, and Chad & Jeremy's new album rewards you with the jackpot. 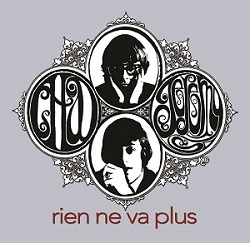 Rien Ne Va Plus collects personal favorites from the last decade, including material from the extremely rare out-of-print "tour CDs", and brand new recordings such as "The Water Is Wide" and a new studio version of the 1983 classic "Zanzibar Sunset". We hope you enjoy it as much as we've enjoyed entertaining you for these last ten, and these last fifty, years. You can order it directly from us, right here. Copyright 2013 Frank Jason Rhoden.